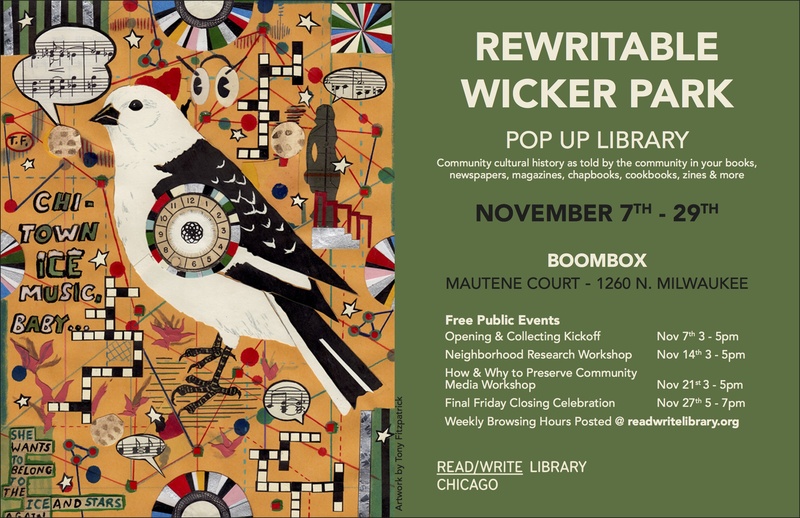 Rewritable Wicker Park is a month-long Pop Up Library and public program series that will showcase and connect the cultural contributions that generations of community members have made to establish the neighborhood as an internationally recognized creative engine. By adding the stories of their organizations, families, galleries, publications, parishes, classrooms, theaters, neighbors and more to the Library’s shelves throughout the month of November, community members both past and present will come together to craft the historical and cultural narrative of one the city’s most dynamic areas. This Pop Up Library will be the first resident in the new Boombox kiosk on Milwaukee Avenue’s Mautene Court, part of Activate! Chicago’s programs for bringing public plazas to life through culture and entrepreneurship. It will be the largest Pop Up Library to date for Read/Write Library as the nonprofit approaches its 10-year anniversary in February 2016. Beginning with media drawn from the collections of Read/Write Library and neighborhood organizations, the Pop Up Library will feature a diverse array of publications including decades of community newspapers, artist books, music and culture magazines, poetry chapbooks, comics, zines, family memoirs, handbills, community plans, and more — representing Wicker Park’s history through the first person, creative expressions of those who have lived, worked, and studied here. Reflecting the interconnectedness of neighborhoods in the West Town community area, the Pop Up Library will welcome Library contributors to determine their own relationship to and definition of the neighborhood as it intersects with Bucktown, Humboldt Park, Noble Square, Ukrainian Village, West Town, and other areas. The Pop Up Library will be open during regular browsing and reading hours (to be posted on readwritelibrary.org), and will host public events and workshops each weekend. Food trucks will have warm food and drink for purchase at each event. All events are free and welcome to all ages. Performances, readings, storytelling, and interactive neighborhood history discussion. Workshop to learn fun and useful techniques for discovering the history of your neighborhood through interviews, research at community institutions, and making connections with your neighbors and local businesses. Hands-on workshop to learn about saving the documents of our past (and present). Activate!, Read/Write Library and partner organizations present closing performances for Rewritable Wicker Park. Activate! Chicago is a new initiative from the City of Chicago in partnership with Latent Design that transforms underutilized public plazas into cultural and economic catalysts. Boombox is a prefabricated micro retail kiosk installed in high volume public spaces to provide short term pop up retail opportunities for local entrepreneurs and community activators. Boombox combines the successful features of pop-up shops and festival booths. It provides innovative transitional retail spaces at affordable weekly rates. This exceptionally designed space will become an iconic attraction that will rival coveted storefront locations without the capital commitment.